Affiliates have expanded roles and enlarged opportunities in program planning and development within the entire NISS Affiliates Program. Industry Affiliates are represented by a Affiliate Liaison selected from applicants nominated from within the affiliate. The Affiliate Liaison has the responsibility for distribution of Affiliate benefits (e.g., guaranteed acceptances to NISS conferences). Industry Affiliates are also urged to appoint an Associate Liaison to strengthen the connection to NISS. Affiliate Liaisons and Associate Liaisons receive regular reports documenting participation from their organizations in NISS activities, as well as regular announcements of opportunities for Affiliates at NISS. Data Scientists and Operations Leadership interested in industry wide issues related to the data science industry. Industry Statisticians, both experienced and junior colleagues searching for training and/or solution paths for existing statistical problems. Access to a rich set of colleagues in the statistics / data science fields to connect and network with from industry, government / national lab and academia. NISS events for cross-sector networking. Special topics, designed for / by Industry Affiliates. Cross-sector conferences and workshops for data scientists. Partnership with NISS to develop training programs in statistical thinking and statistical methods tailored to Affiliate needs and audience. at NISS location or on-site at Affiliate. Priority and/or guaranteed acceptances to NISS activities, workshops, conferences, etc. - with express inclusion of new or modified associated privileges for the Affiliates' junior associates, and postdocs. Opportunities, such as the sharing postdoctoral fellows and the planning joint programs with NISS, are highlighted with mechanisms established to implement them. Presence on the NISS website include links to your own web pages, articles that highlight the affiliate, events calendars including co-sponsored Affiliate-hosted conferences, and free advertisement of job announcements for open job positions. Industry Affiliates propose and prioritize topics for annual Special Topics workshops. Workshops organized by NISS on topics in Data Science for Leadership from Industry Affiliates. Workshops on “hot topics” in industry to bring to the attention of the statisticians’ research community. Presentation of a cross-sector technical program. Networking with leading academic and government statisticians. Program planning of Affiliates’ Special Topics workshops for the year. 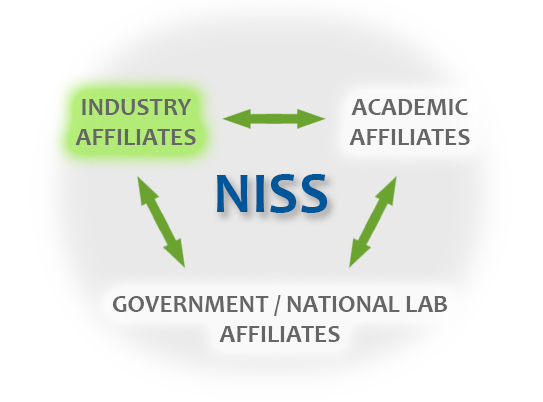 NISS Industry Affiliates membership fees from $10,000 per year. Get involved! Get connected! Use your involvement in NISS to help grow your professional development programming for your institution's statistical professionals. MORE INFORMATION ON BECOMING A NISS AFFILIATE? Visit our Become an Affiliate page and fill out the form to let us know you are interested in becoming an affiliate. Or, contact the NISS office via email at officeadmin@niss.org.